I’m really digging the adjustable arm rests, which can move forwards and backwards in addition to pivoting inwards and outwards. Now, I can be right up against my desk, and my forearms are supported by the armrests while typing. This wasn’t possible with the Aeron, whose armrests only pivoted inward. I also picked up the optional lumbar support and headrest, which will help to reduce neck and back strain during those 10-12 hour coding or editing sessions I frequently find myself in these days. Will do, Sean. Does your Think have the headrest or lumbar support? What setting do you have your preference control set at? I’m currently using the weight-activated, 20% boost setting. I don’t have one anymore, so I don’t remember the settings I liked, but I tried many permutations over the course of about six weeks before trading it out for something else. It did have the lumbar support, but not the headrest. It was really weird, because I could get settings that felt good while I was sitting in it, but I still ended up with lower back pain after a while. It’s hard to adjust for something like that, since you have to wait a long time between each adjustment to see if it helped or not. I can’t even definitively say it was the chair causing the problem, but it did get better when I switched chairs. That’s a sweet chair but I’d have a hard time justifying $600 for a chair. Even with the discount. I love all that is ergonomic. 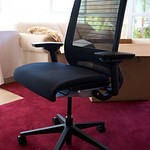 I’ve actually tried out all three of the Mirra, Aeron and Think chairs. I knew that if I was going to spend the money on it, I wanted to make sure I got one that fit me. I had a hard time with the arm rest too, so I called the company I got it from, OfficeDesigns.com, and they gave me a step by step lesson on how to get it to fit me perfectly. The lumbar support is supposed to be at the top of your belt and I had no idea until I talked to one of their super friendly reps. I decided on the Aeron and I think its totally worth the money spent, especially when your sitting all day. What are the back flexors made of? They look like plastic rope, does it get uncomfortable after awhile? Have you sat on an AMIA? Mine are made from metal. Haven’t sat on an AMIA yet. More interested on how one can get that 40% discount again???? discounts? Try Steelcase’s new chair, cobi. Great price, great design– and guess what else is great? A FREE ONE! Tell Smart Furniture why you need a new home/office chair and you could win 1 out of 5 cobi’s. Happy Writing!